Gomal Medical College MTI Dera Ismail Khan Khyber Pakhtunkhwa. 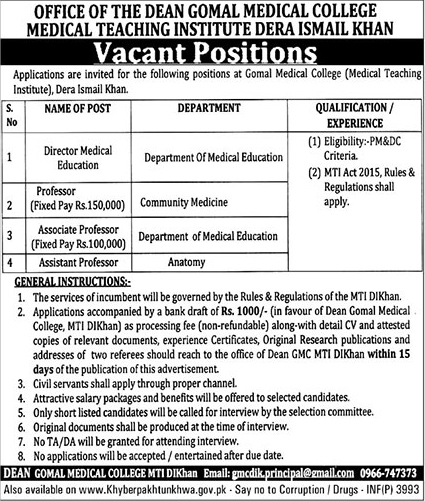 Applications are invited for the following positions at Gomal M.. College (Medical Teaching Institute), Dera Ismail Khan. DEPARTMENT: Department Of Medical Education. (2) MTI Act 2010 Rules & Regulations shall apply. 1. The services of the incumbent will be governed. by the Rules & Regulations of the MTI, D.l.Khan. 2. Applications accompanied by a bank draft of Rs. 1000/. (in favour of Dean Gomal Medical College, MTI D.I.Khan. as processing fee (non-refundable) along with detail CV and attested copies of relevant documents, experience certificates, the Original Research publication and address of two referees should reach to the office of Dean GMC MTI D.I.Khan, within 15 Days of the publication of this advertisement. 4. Attractive salary packages and bend. will be offered to select. candidates. 5. Only shortlisted candidates will be called for interview by the selection committee. 6. Original documents shall be produced at the time of interview. 7. No TA/DA will be granted for attending the interview. 8. No applications will be accepted. / entertained alter due date. GOMAL MEDICAL COLLEGE MTI D.I.Khan.